Platform businesses like Amazon, Google, Apple, Alibaba, and Facebook are dominating the global economy. In the last 15 years, 52% of the Fortune 500 companies have disappeared. We speak to the remaining 48% as they learn, innovate, and thrive in the digital era. Modern Monopolies Podcast defines what it takes to dominate the 21st century economy. The show focuses on how the linear business models of the 20th century will (and are) losing to the platform business models of the 21st century - and what traditional businesses plan to do about it. Over the last 20 years, platform businesses have outperformed the broader market. These Modern Monopolies operate at a massive scale and are highly defensible. In Season 1, hosts Alex Moazed and Drew Moffit interview the leaders of billion-dollar companies to push the conversation beyond digitization, and explore how platform technology disrupts industries, and what big business can do to thrive in the new digital era. Alex co-authored the best-selling book, Modern Monopolies, which defines the platform business model dominating the 21st century economy. 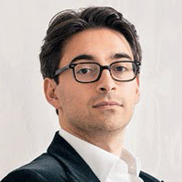 Alex Moazed is the Founder and CEO of Applico. He founded Applico in 2009 when he was 20 years old. In his role as CEO, he works directly with Fortune 500 C-suites and boards to help them build or buy their own platform businesses. Drew Moffitt is a successful entrepreneur with an extensive background in growth hacking, startup marketing and monetization of platform business models. Drew currently holds the position of Director at Applico, and works with Fortune 500 companies to design and execute defensible and scalable platform businesses. Thank you! You will be informed when the first episode is released.